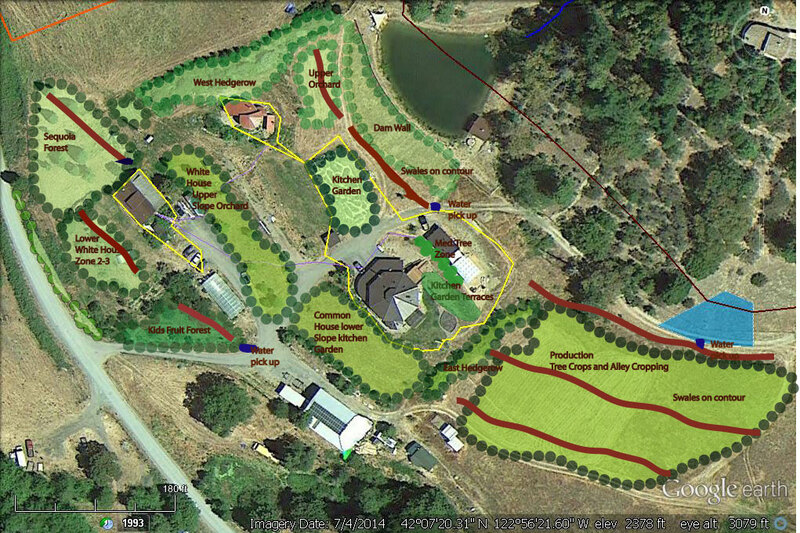 Full Bloom Community Farm is located in the Little Applegate in Southern Oregon’s Siskiyou mountains. With Yale Creek and Quartz Creek running through the property the farm has good water resources. We spent several months on a design plan for 2015 with the goals of growing more food and installing perennial food systems on the property. The design goals of creating more perennial food crops led us into three design projects. We expanding the already existing food forest below the greenhouse. Several hundred fruit tree root stocks were ordered and grafted. An order was placed with a wholesale nursery of walnuts, honey locust, plums, mulberries, currants, peashrubs, serviceberry, goumi and autumn olive for a large alley crop planting. We were able to plant several hundred trees and shrubs with many left over for next seasons plantings. The design diagram above is basis of our installation. The survival rate was close to 100%. Let us know how we can help you design your farm or homestead.